The Musee d'Orsay's current collection of Van Gogh paintings are from the last three years of his life. These tortured days under the strains of mental illness were unceasingly burdensome. But Van Gogh found found solace through his painting, engaging in the most creative period in his life. Looking back, critics agree it was one of the most creative periods of any artist in any time. In February of 1888, he moved to Arles in the South of France and wanted to establish an art school. He invited Paul Gauguin to join him. His mental problems intensified. In December of 1888, he cut a off a portion of his ear, and committed himself to a mental asylum in Saint Remy. In the same month, he ended his friendship with Gauguin. After nearly a year and a half at Saint Remy, he left in May of 1890. That same month after consultations with his brother Theo, he moved to suburban Paris. Under the recommendation of his friend Camille Pissarro, Van Gogh submitted to the care of Dr. Paul Gachet in Auvers-sur-Oise. But less than three months later, Van Gogh was dead resulting from a self-inflicted gunshot wound on July 29, 1890. 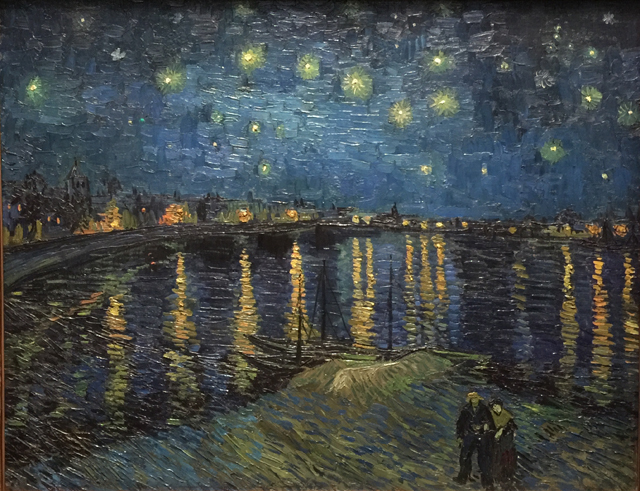 While living through these three tortured years, Vincent Van Gogh painted his Self Portrait with a Straw Hat (1887), Starry Night Over the Rhone (Sept. 1888), The Café Terrace on the Place du Forum, Arles, at Night (Sept. 1888), Vincent's Bedroom in Arles (Oct. 1888), Irises (May 1889), Starry Night (June 1889), Almond Blossom (Feb 1890) and much more. 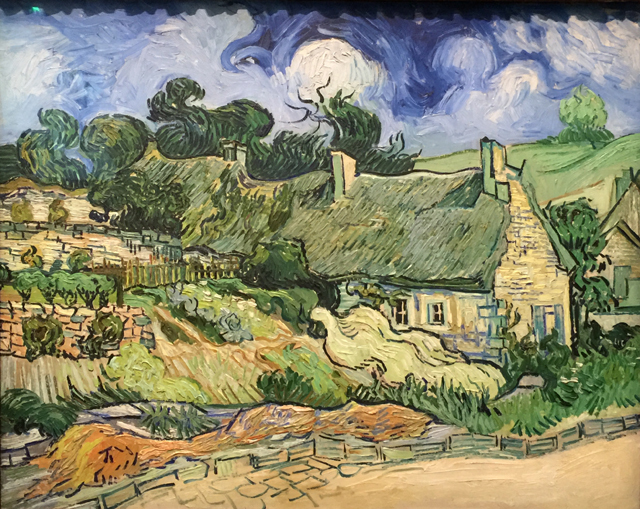 Below are the Van Gogh paintings currently on display at the Musee d'Orsay. Information for each painting is drawn from the museum's accompanying placards and the Musee d'Orsay's website. close of the 19th century. Van Gogh painted this still life in Paris while in close contact with Paul Signac. Van Gogh used Neo-impressionist principles in the background, contrasting blue and orange. But overall, neo-impressionist influences are limited, used only to define a solid surface. 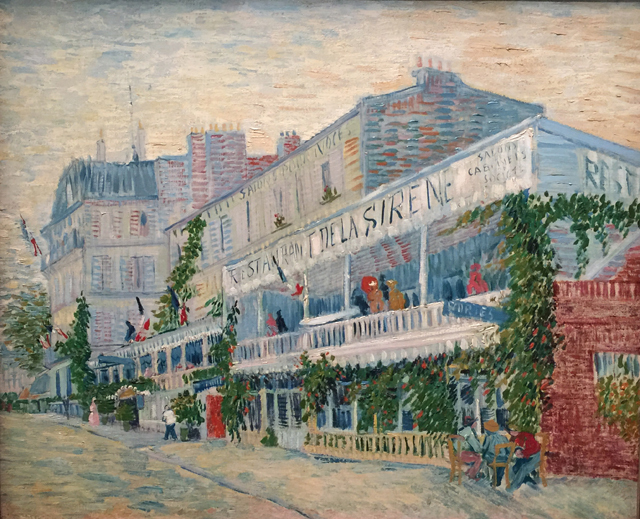 The Restaurant de la Sirene at Asnieres, 1887 In 1888, Van Gogh lived with his brother Theo on the north side of Paris. Unlike other artists of greater means who went to the countryside in the summer, Vincent remained in the city. In Asnieres, on the banks of the Seine not far from Paris, he painted bridges and this restaurant. Like Renoir, Vincent tried to capture the convivial pleasures enjoyed inside the restaurant while painting its exterior. 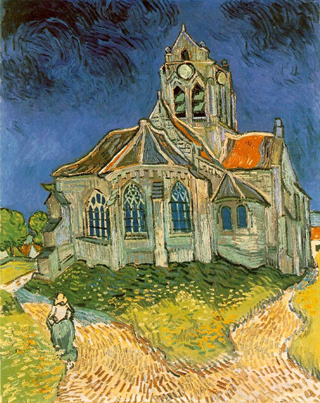 Here Van Gogh used multiple colors in his parallel hatching, a technique he increasingly used to great effect. Van Gogh Museum in Amsterdam. The second, done in September 1889, is in the Art Institute of Chicago, and the third resides in the Musee d'Orsay. The paintings are not identical. Portraits pictured in the painting are changed and the intensity of color changes. 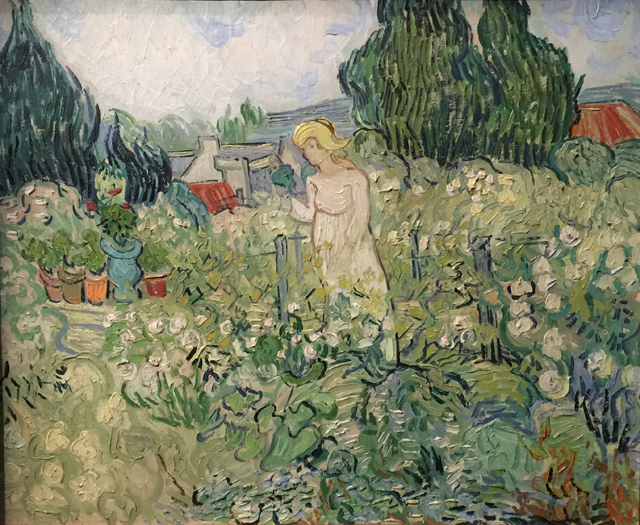 The third painting is smaller, among a group of smaller paintings Van Gogh made for his mother and sister Wil. 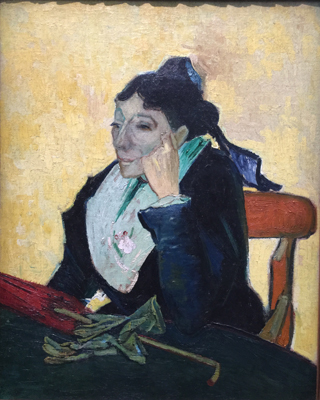 Portrait of Madame Ginoux, 1888 Madame Ginoux owned the Cafe de la Gare in Arles where she often served Vincent Van Gogh and Paul Gauguin. Van Gogh painted this portrait when he lodged at her house when he first arrived in Arles. She remained a close friend with Vincent throughout his stay, because she too suffered from "nervous attacks." Van Gogh's paintings, giving his work expressive significance. But, for a poor painter, the process required more paint, requiring Vincent to repeatedly ask his brother Theo for extra money to buy art supplies. 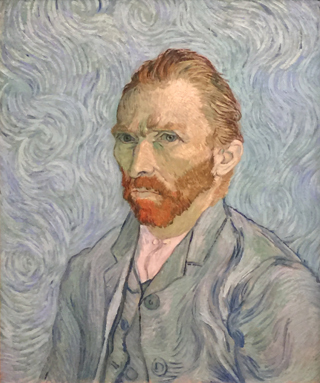 Vincent Van Gogh, Self Portrait, 1889 Van Gogh painted 43 self portraits over ten years. This is not just an artistic exercise; Vincent was questioning himself to the point of an identity crisis. He wrote to his sister: "I am looking for a deeper likeness than that obtained by a photographer." And later to his brother: "People say, and I am willing to believe it, that it is hard to know yourself. But it is not easy to paint yourself, either. The portraits painted by Rembrandt are more than a view of nature, they are more like a revelation." The painting's focus is Vincent's face, hard, emaciated, with green rimmed eyes seemingly intransigent and anxious. His still and fixed posture contrasts with the undulating hairs of his orange beard and the hallucinatory arabesques of the background. wrote his brother Theo saying, "I need a starry night with cypresses or maybe above a field of ripe wheat." In a letter to fellow artist Emile Bernard Vincent said, "But when shall I ever paint the Starry Sky, this painting that keeps haunting me." In September 1888, he wrote his sister, "Often it seems to me night is even more richly colored than day." After a few months at the mental institution, he created a second version of Starry Night, this time exhibiting evidence of his troubled psyche with trees shaped like flame throwers and stars in swirled motion. This later version is the collection of the Museum of Modern Art, New York. The Siesta, 1889-1890 While still a patient at Saint-Remy, Vincent painted a scene from four drawings by the Barbizon painter Jean-Francois Millet (1814-1875). Vincent often copied the works of Millet whom he considered more modern than Edouard Manet. Justifying the painting to his brother Theo, Vincent wrote, "I am using another language, that of colors, to translate the impressions of light and dark into black and white." 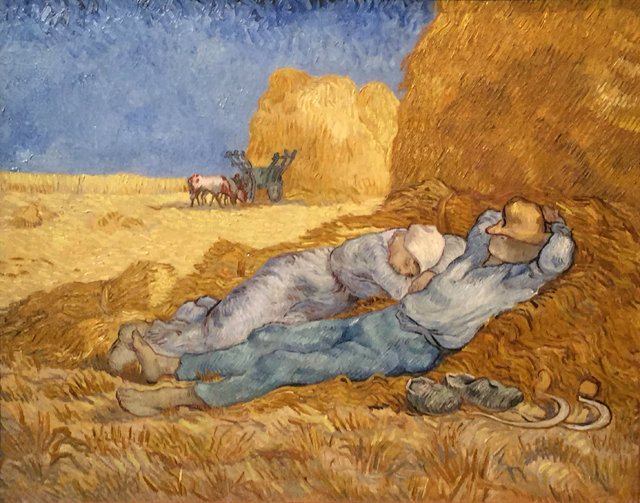 This restful scene done by Millet of rural France from the 1860's is transformed by Van Gogh's unique artistic intensity, and his chromatic construction based on contrasting complimentary colors, blue-violet and yellow-orange. Eugene Boch / The Poet 1888 Van Gogh met Eugene Boch (1855-1941), a Belgian painter in Arles in June of 1888. Around 8 July, Vincent mentioned Boch in a letter to his brother Théo: "I very much like the looks of this young man with his distinctive face, like a razor blade, and his green eyes". 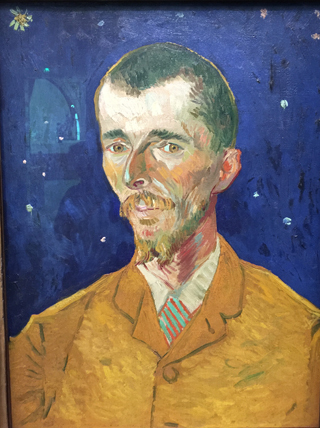 In late August, Vincent painted Boch's portrait. Vincent wrote of the experience, "Well, thanks to him (Boch) I have at last the first sketch of this painting that I have dreamt of for so long – The Poet. He sat for me. His fine head with his green eyes stands out in my portrait against a starry sky of deep ultramarine; he wears a short, yellow jacket, a collar of unbleached linen and a colorful tie." 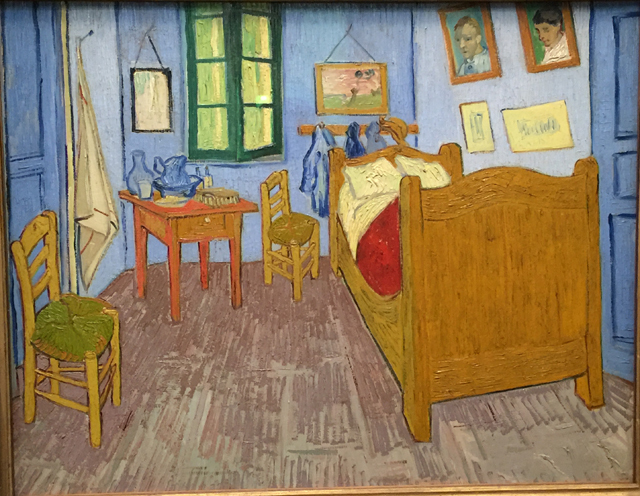 Although Vincent considered the painting to be only a sketch, he hung it for a a time on the wall of his bedroom, and it is visible in his first painting of his bedroom, now at the Van Gogh Museum in Amsterdam. 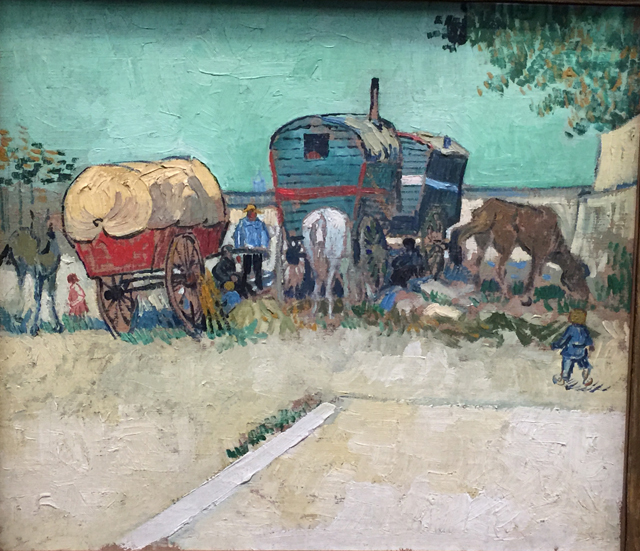 Theo and artist Camille Pissaro wrote a letter of introduction for Vincent to present to Dr. Paul Gachet, a homeopathic physician who lived in Auvers. The Gachet house was set into a hillside above the Oise Valley, its garden frequented by stray cats, chickens and a featherless rooster. This painting shows Marguerite Gachet in a country girl pose. A few days later, he painted her in a pink dress while playing the piano. Marguerite was 21 at the time, and when Dr. Gachet heard of her posing, the doctor was apprehensive and he asked Vincent to end pursuing any relationship. 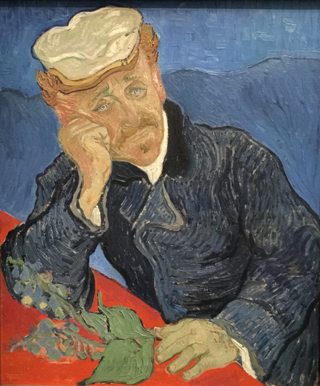 Portrait of Dr. Paul Gachet 1890 Van Gogh was deeply entwined with Dr. Gachet the last two months of his life. A homeopathic doctor interested in chiromancy (palm reading), he had a passion for the arts. He was an accomplished engraver, and had associations with Manet, Monet, Renoir, Pissarro and Cezanne. 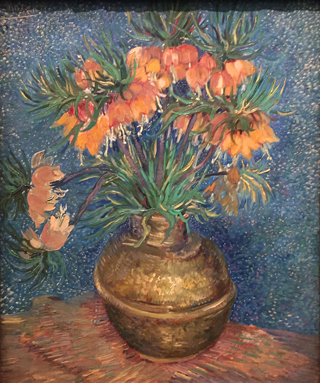 It was Theo and Camille Pissarro who recommended Gachet to Vincent, thinking the doctor's company and care would help Vincent make the transition from his stay at Saint-Remy back into normal life. In this portrait, Dr. Gachet appears melancholic. He may have been overwhelmed caring for and listening to Vincent. His dark blue jacket contrasts with the bright red table. The pale unexpressive face is propped up by his right hand. On the table is a clipping of foxglove, the plant used to make the heart drug digitalis. Doctor Paul Gachet's Garden, 1890 This version without Marguerite of the Dr. Gachet's garden is darker, intensely colored with shorter and straighter strokes while the one with Marguerite is lighter colored, softer, with gentle curved strokes. were as alive as the woman walking on the path below its stained glass windows. He seems to release the church from its firm 400-plus-year-old foundation, allowing it to move and flow like torrents of lava. 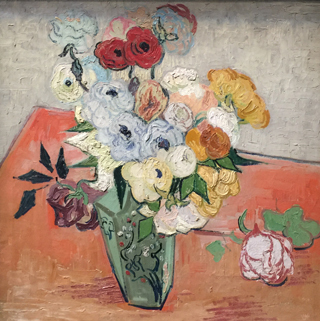 Japanese Vase with Roses and Anemones 1890 This work was painted soon after Vincent's arrival in Auvers. 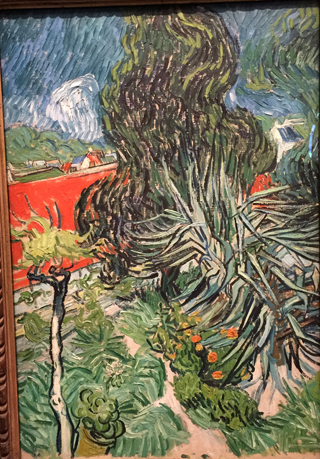 In his writings, Vincent suggested that this painting was done in Dr. Gachet's house with flowers cut from his garden and using one of his vases. Initially, Vincent was happy with his move north and stimulated by his friendship with Dr. Gachet. Vincent had done a number of floral still lifes while still in Saint-Remy, and continued the practice when he moved north. undulating and distant trees spiraling up into a swirling sky. With peaks and troughs of waves of impasto, Vincent creates waves moving through the picture like a disturbed surface of a reflective pond. Van Gogh did not have the slightest hint that the waves of paint he was creating would splash upon the eyes of millions of Van Gogh admirers a century later. 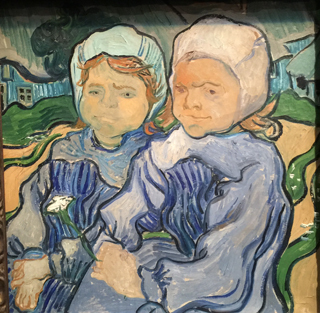 Two Young Girls 1890 Painted in early June 1890, Vincent portrays these two young girls against a wavy background of curvy green rows of a field, with blue houses or farm buildings behind, complicated with the blues of their clothing. The painting doesn't seem to be about the girls or the moving environs in which they live, but rather that the two girls are a part of the scene, taking an impatient moment stolen from their play to briefly pose for a kind red bearded artist. near Paris to modern times in an effort to give Vincent a sneak a peek at what will become of his paintings. Matt Smith, Karen Gilllan and Bill Nighy with Vincent played by Tony Curran. Today, Van Gogh is a cultural icon. His name ranks among the the most well-known painters of all time. His dashing stokes, waves and swirls are recognizable and loved by the wide population, not just a few connoisseurs inside the art world. But Vincent Van Gogh never knew his name would live beyond his poor, tortured and brief life. He never knew his paintings would be known the world over. 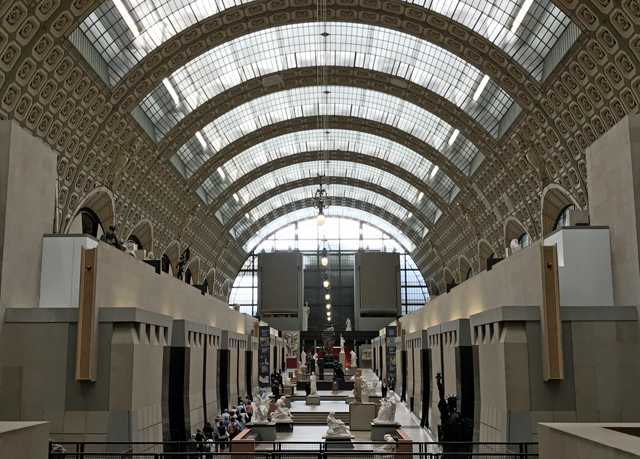 A 2010 episode of Dr. Who examines this reality, while offering a fanciful remedy, as Dr. Who visits the Musee d'Orsay in modern times. Graton is home to something special, an old apple warehouse filled with working artist's studios. Each year, the building hosts an open studios event, along with local food, wine and music. 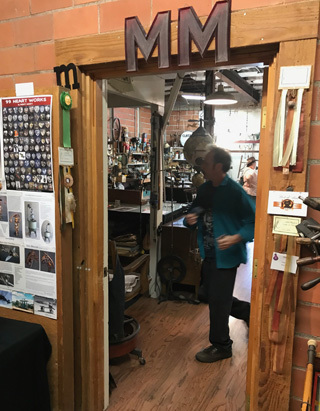 Locals anticipate the opportunity to visit artists in their creative space. Below are photos from each studio, links to each artist's webpage and excerpts of their artist statements. Linda's Artist Statement (LindaSorensenPaintings.com) ... "I was born an artist, but at a time when women were not wanted in the New York City art world. Although I was a serious artist, to support myself I headed to law school at Berkeley in 1973 for one of the first classes to admit women in significant numbers; and I have been a San Francisco business litigation attorney for over 40 years, now semi-retired. For me, it makes a good combination of pursuits. 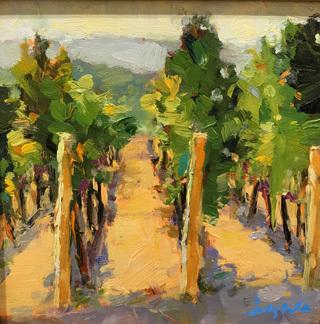 "I was an abstract expressionist in Berkeley starting in the 60’s, but now my art is closer to representational, inspired by “living in a painting” in Sonoma County. My approach is personal, expressive. I discovered kindred spirits in the Post-Impressionist “symbolist”/“synthetist” painters (Paul Gauguin, Henry Moret, Odilon Redon, etc.) of Brittany, who emphasized strong colors, emphatic line, and altered and mixed perspectives. There are differences such as my depth of scene instead of flat pattern. 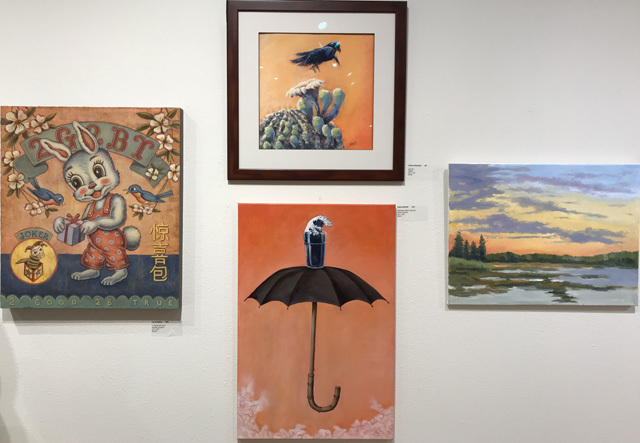 "Galleries that carry my paintings are the Art Trails Gallery at Corrick’s in Santa Rosa, Bodega Landmark in inland Bodega, and the “Red Shoes” studio gallery at the 6th Street Playhouse in Santa Rosa." Susan's Artist Statement (SusanProehl.com) ... "I begin my paintings or collage work by painting out the white of the canvas … with the color orange. Orange is a favorite color and has a way of shining through the various layers. I then create marks or lines using oil pastel, pencil or chalk to give direction. This background grounds me. "I work intuitively responding to the color, texture and space of the canvas. I experiment with layers of acrylic paint and glazes. Exposing and re-exposing these layers, using various tools and methods to apply and scrape the paint onto the canvas, leads me onto a journey, a story …. "When working on a collage I incorporate found objects, ephemera and various types of paper into the piece. Often times it seems as though the brush is leading me … that the painting already exists and wants to me follow the course …to listen. My paintings are colorful abstracts. The work is my statement. The interpretation is yours!" From Monty Monty's Website (MontyMontyArt.com) "I assemble to create a theme. Discrete items of interest and vintage collectibles are sculpted into a whole and unified form. 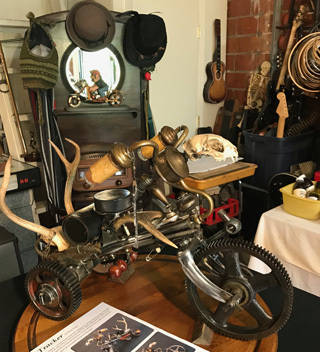 I take antiques, curios, cast-off objects, and sometimes family heirlooms and breathe new life into them, rendering new ways to look at old things. My approach is to create a natural look to the assembled work by using creative methods. I do not weld. I take great care in the restoration of each component and attempt to create a vintage quality within the work. 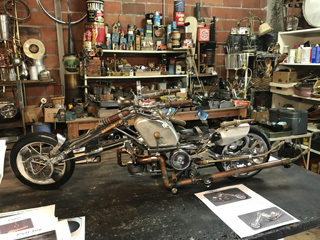 I enjoy sharing stories about each new piece I create and include an itemized list of components with information that accompanies the work." From Susan's Website (SusanStover.com) ... "My paintings and sculptures often recall an ethnic sensibility and geometric organization. I am interested in the objects made by non-Western cultures and how they are tied to identity, status, religious beliefs, and mythologies. Adapting processes that are traditionally used in the production of textiles, I use materials and techniques that refer to a collective history with the completed painting and forms revealing themselves in the making. "Pattern and repetition are an integral part of the work as I dye fabric, melt wax, embed fibers, and construct surfaces. I am intrigued with how repetitive labor, such as stamping, stitching and constructing, can be transformational and meditative. I choose these methods because it connects me to people in other cultures who work in the same way. Because of these interests, I continually explore my own ties to history, culture, and the arena of contemporary painting and sculpture." From Elizabeth's website (HouseDrawingToOrder.com) Drawing is the honesty of the art. There is no possibility of cheating. It is either good or bad." Salvador Dali ... "I've been drawing as long as I can remember ... 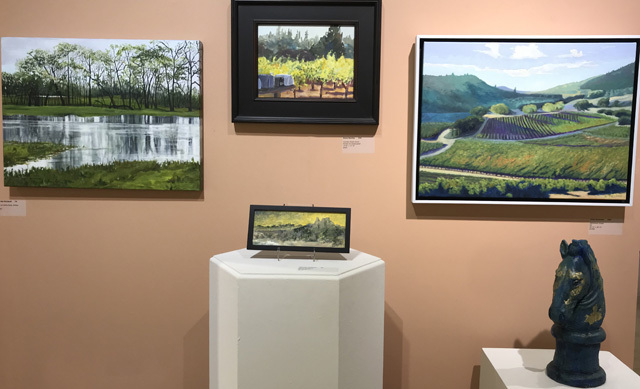 In recent years, my work has been shown at Sebastopol Center for the Arts, Berkeley Botanical Gardens, Filoli, Transition Art, West County Design Ctr., Pelican Art, Helen Crocker Russell Library at San Francisco Botanical Garden, Local Color Gallery, Bodega Bay, Graton Gallery, Finley Center, and more. I also participate in Open Studio programs- Art at the Source, Art Trails (sabbatical for 2016) , and the Atelier One . My studio in Graton is always open by appointment." From Marylu's website (http://www.sonic.net/~rhouse/) ... "Most of my life I've made art. For many years I created more functional art: dolls, puppets, painted boxes, original games and wearable art clothing. After completing a large order of hand-painted scarves for Nordstrom, I longed to leave production art and just paint, and I did that in 1993. "I often work from the imagination but also use references. I create commissioned work from a meeting with the person, or family and continue from photographs. I've shown at many galleries and created the 1999 Sebastopol Apple Blossom Festival poster, won the 2001 KJZY CD cover competition, created art for Watershed Day and for the Virginia Wolfe Conference at Sonoma State. I have done covers for many books and enjoy these projects very much. I also participate in the open studio events Art at the Source in June and Sonoma County Art Trails in October. Check the Art Shows section for upcoming events information. My art is in collections worldwide and I like to think that I am making a connection through paintings. I hope you find something in my art that makes you smile, or perhaps the colors match your sofa!" From Cindy's website (CindyClearyArt.com) ... "My art is an intimate act of remembrance, that embodies the silence of our innate knowing. 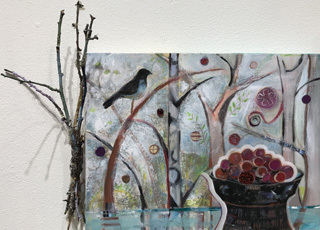 Making art from the interconnectedness of life, consciousness and the natural world, I explore the emotional landscapes of memory, place and time in both two and three-dimensional forms. "I work with soil, earth and plant pigments, sea water and other organic materials. The stories held by these elements guide my exploration of the ephemeral, the transitory, the natural circle of birth, death and regeneration, and the transformative power of disintegration and loss." From Charles' website (CharlesBecker.com) ... "Light and how it effects things is a prominent element in Becker's work. 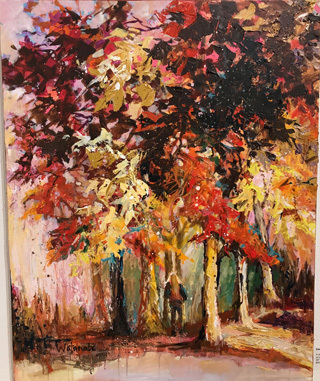 Motivated by the desire to make a personal connection with the viewer through his paintings, he uses light and color to infuse each object with as much feeling and nuance as he can (which is where Becker's work goes beyond photo realism, which he finds static and uninteresting). In that sense, rather than paint a simple apple, he paints a portrait of that apple with colors that make it seem more than real; rather than paint a simple plum, he gives it a little more curve and cleavage so it has a sensual energy all its own. "He starts with careful sketches--most of which end up under the painting itself. While he usually has a finished concept in mind, he allows plenty of room for the painting to evolve. As he works, he adds balancing points -- touches that make it more comfortable, warm, or tense, or elements of interest that push and pull at the edge of realism to capture someone's eye from across the room and draw them closer where the painting, rather than falling apart, reveals new, sometimes surprising, dimensions." 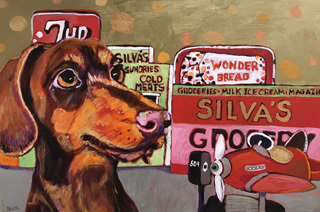 From Lisa's website (LisaBPaintings.Blogspot.com) ... "Lisa Beerntsen lives and paints in Graton, California. She and her husband, fellow artist Tony Speirs, moved to Sonoma County from the East Bay in 2002. "Lisa has been an adjunct art instructor at the Santa Rosa Junior College for over 10 years, where she teaches classes in color, painting & drawing. She has previously taught courses at the San Francisco Art Institute, California State University, Stanislaus, & the Universities of Maine & Massachusetts. "One of her recent bodies of work is characterized by underlying abstract forms, color, and movement, overlaid with patterns culled from diverse cultures (Islamic, Celtic, Tibetan, American quilters ...), & images of plant and flower forms. Some paintings also include collage, from a variety of sources; many of the recurrent designs are from stamp blocks she carves herself. An avid gardener, she is much inspired by the changing colors & light of nature. She moves easily between different modes of painting, from realistic to abstract. Lisa also recently collaborated with Tony Speirs and the collective of artists 'Art Farm Motel' on several very large scale painting-installation projects for the Burning Man Art Festival." From Funeria's website (Funeria.com) ... "FUNERIA is a unique international arts agency that has been leading the emerging genre for original, contemporary, thoughtfully conceived and superbly crafted funerary urns and vessels for people and our beloved animals since 2001. "Each original artist-made and artist-designed personal memorial artwork we offer, through retail channels worldwide, stands on its beauty alone and is as unique as the individual it will serve. Each embodies the creative spirit that produced it, and holds the promise of reminding us of a life we've loved. All are intended to contain the shell-like particles and dust of cremated individuals, at least for a time. Whether kept at home, buried, placed in a glass-fronted columbarium niche or private mausoleum, or used to scatter their contents in a place of special significance, artist-made and artist-designed urns, vessels and personal memorial objects honor the life of their recipient and they honor the gifts of the artist." From Britta's website (BrittaKathmeyer.com) ... "Britta Kathmeyer (born in Bremen, Germany, 1963) received a diploma in Textile Design from the College of Art and Design, Hannover, in 1988. She continued her studies in the U.S. on a Fulbright scholarship and graduated from the California College of the Arts, Oakland, with an MFA with high distinction in 1991. "For many years Britta worked as a textile designer in the Bay Area and at the same time exhibited her artwork in galleries in both Germany and the U.S. She has collaborated on various projects with artists and non-artists alike, including a public art project funded by the San Francisco Arts Commission. Since 2012 her focus has shifted to drawing and painting primarily using ink, coffee, matches and acrylics. Her intention is to create art that moves between ambiguity and revelation, and inspires contemplation and curiosity. Her work is influenced and guided by Eastern philosophy, the observation of nature, and often the inherent characteristics of the materials themselves. She lives in Sonoma County." 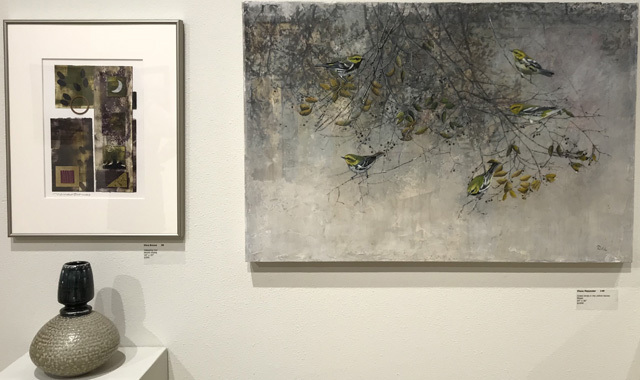 From Erickson Fine Art Gallery's website (Erickson Fine Art Gallery) ... "Robin Eschner grew up in a family that explored the natural world. Her father is a geologist whose enthusiasm for the local terrain is legendary. At an early age, Eschner understood the connection to and responsibility for plants, animals and the landscape. She was educated at the University of California at Davis, Graduating with a combination B.S. degree in Botany and Fine Art. 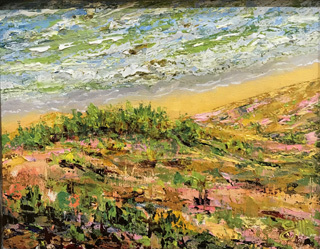 As a painter, she has spent nearly 25 years exploring those relationships in nature. 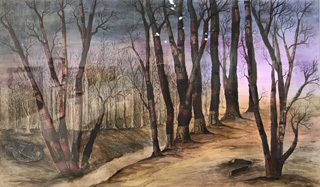 Eschner has exhibited at significant galleries throughout the US and in l990 she began a collabortion with Barry Lopez on a book titled "Apologia", a non-fiction environmental and ecological statement, combining his writing and her art." 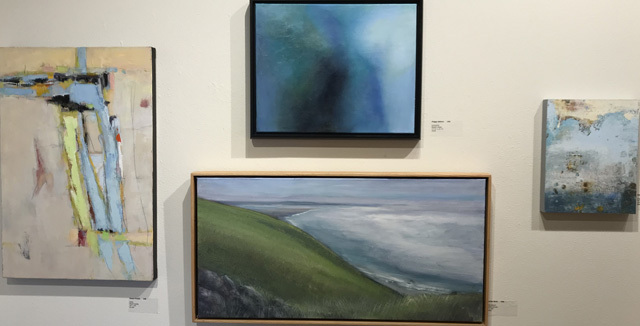 It's October, and time for Sonoma County's celebration of local art. 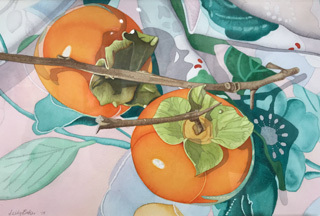 Art Trails, a program of OPEN STUDIOS for Sonoma County artists returns this year with 18 new and 126 returning artists. Studios will be open 10 - 5 pm, Saturday and Sunday the weekends of October 13 & 14 and 20 & 21. 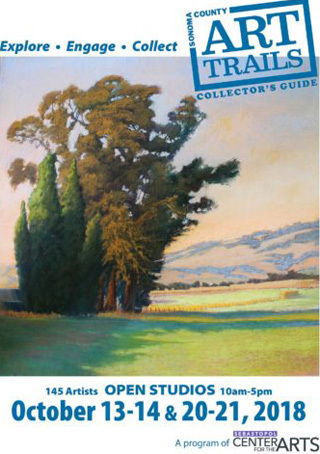 Maps to all studio events are contained in the Art Trails Collector's Guide, available at the Sebastopol Center for the Arts and throughout the county, and is AVAILABLE ONLINE. Last year, all the hard work and preparations for Art Trails went smoothly until the week before the opening weekend when Santa Rosa and Sonoma County experienced the fire storms of 2017. Along with many county residents, some participating artists lost their homes and studios. It was one of those times when it was all hands on deck. The county, communities and individual citizens strained to meet the needs of our displaced neighbors, stretching resources and creating new ways to help. In that extraordinary moment of urgency and need, Art Trails was a pretty small concern. But the artists discussed and debated what to do. A controversial decision was made to not cancel Art Trails, but to postpone it one week. This decision, painful at the time, proved to provide a much needed respite from the trauma of the fires. 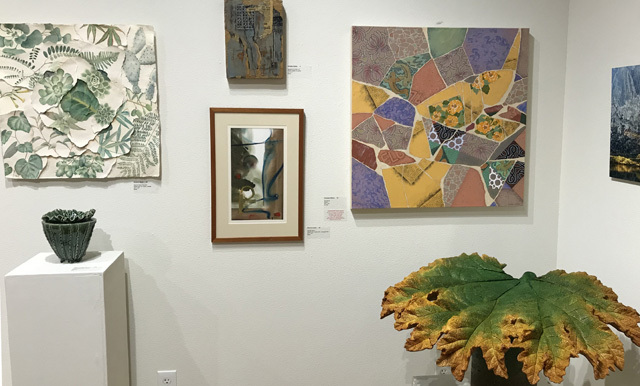 After the fires, people came out to Art Trails open studios, and with the backdrop of artists and their art, people talked about their experiences and listened as others told their stories. A year later, Art Trails artists are again ready. The preparations have been made. But no one forgets the trauma of last year. 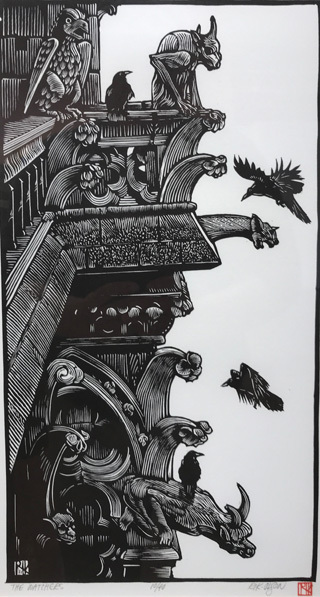 The artist community responded well, donating art to those who lost homes, assisting artists who lost their studios, and continuing to see the value of art and artistic expression in rebuilding broken lives and spirits. Art is life, and part of our healing and paths toward recovery can be encouraged and fortified with art. All the paintings on display there are available for sale, and each painting is just a sample of each artist's work. More is to be found at their Open Studio. At this exhibition, you can decide on which artists appeal your individual tastes, and then you can use the Art Trails guide to map out the studios you wish to visit. Of course, as you drive around the county, you will discover the Art Trails blue signs, and make serendipitous discoveries of artists you would not have otherwise encountered. Its an adventure, two wonderful weekends offering a unique opportunity to see art and meet the artists who created that art in their creative space. Enjoy! her Open Studio won't be open. ... Fri, Sat, & Sun, Aug 31, Sep 1 & 2, Noon-5:00. See article above.